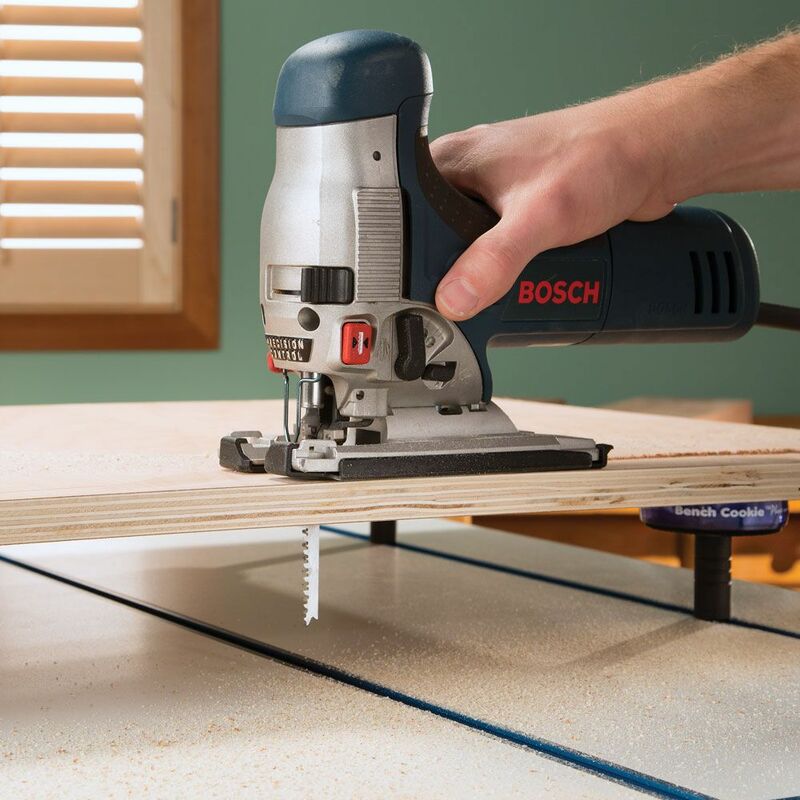 Versatile T-Track allows for fast, stable sawing, sanding, routing or assembly. 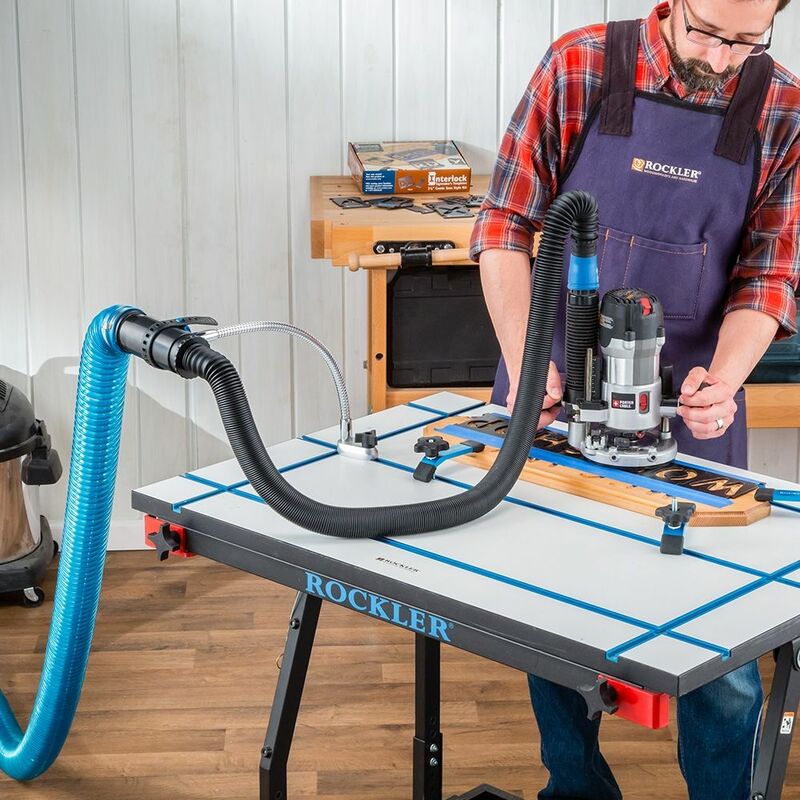 Considering the wide variety of T-Track accessories available, the utility of the Rockler T-Track Table Top is virtually limitless. 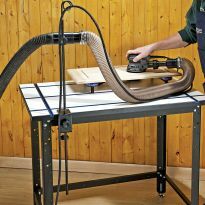 Clamp objects at the edge of the table, in the center of the table and anywhere in between for fast, stable sawing, sanding, routing or assembly. 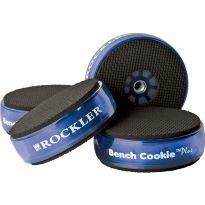 Use it with any of our many T-Track Hold Downs, or with our Bench Cookie Work Grippers and the Bench Cookie T-Track Risers (#46311, sold separately). 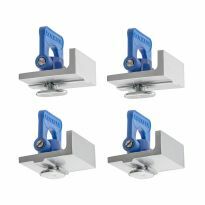 You can also use it with toggle clamps mounted on our Toggle Clamp Mounting Plates (#24872, sold separately). The spacious top measures 28" x 40", larger than most comparable tables. 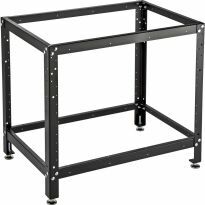 Mount it on a shop-built base, or on our 24"W x 36"L ShopStand (#48089, sold separately). Great addition to my shop. It will increase my ability to build quality products. 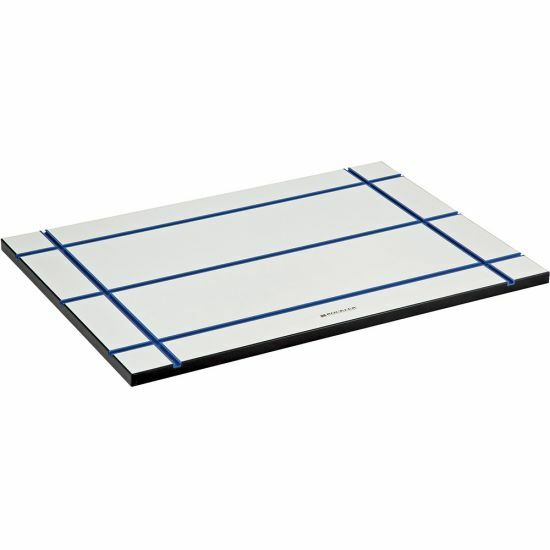 Put large silicone mat over it to protect when not using the clamping table. Nice addition to my heated garage. I was able to attach it to my works table and it works great. have sanded on it, cut on it and put my shelves together. Wont paint on it. The T track system is so easy to use. I built my table top into my workbench last year, and am so very happy I did... the fact was, I designed the bench around the T Track Table, putting it on the end so I had access to three sides. it has become my main assembly area ever since. I’m very limited in space in my small shop (smallest bay of a three car garage), so every inch is needed. 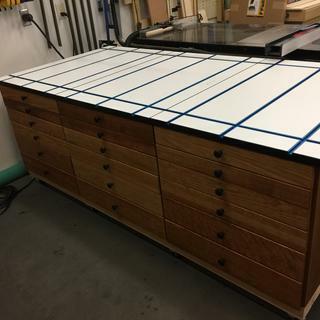 My intention was to build a drawer beneath, to store all the clamps, stops, and all the other do-dads that work with the Table... that was a year ago, and I still haven’t gotten around to finishing it... I keep a plastic bin stored below for all the accessories.... someday, I’ll get around to doing the drawers. Pick one up, you won’t regret it. Have not used it much yet, but quality construction and all the accessories appear to be well thought out. Would recommend. Best investment I'Ve ever made! it’s so nice to buy something online and find out that all the accolades weren’t just sales hype. It’s hard to imagine out this set-up could be any better. I bought the top with the stand and several of the add-ons. I also ordered four locking casters that roll and swivel silky smooth. I’m into building wooden flags these days and this will help immensely with clamping and assembly. Right off, I was impressed with the quality of the pieces and the straight forward approach to the assembly. Everything was well packaged with no missing parts. I wasn’t hurrying but the total assembly time was probably an hour. I ordered some t-bolts and knobs to make some related fixtures of my own design. I’m so impressed. So much, in fact, that it’s standing in my living room at the moment. My wife made a tongue-in-cheek comment about it being a nice side table. You all better getcha one! Very good Very good Very good. Highly recommend the product, along with the leg assembly. It makes working small projects so much easier that need to be held. A great solution to needing 3 or 4 hands. I also added two drawers in a small case. I made them out of Baltic birch and MDF and attached the case to the metal frame to store the hold down items for the T-track system. Excellent value, especially when on sale. These tops are accurately made as described. 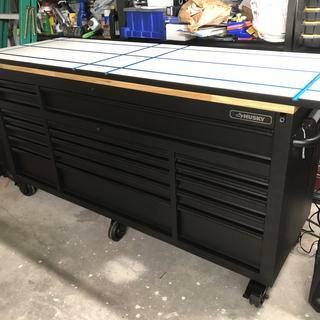 The sum of all track pieces exceeded the cost of this table top so it was an easy decision to buy it from Rockler instead of purchasing the track pieces and making my own top. I thought about building one from scratch, by then I priced all the T-Tracks and t-track Intersection Kits, and the melamine coated MDF. Glad I bought from Rockler. I'm enjoying the flexibility of moving the table top to my work area of need--I elected not to use a mobile base. It and the variety of clamps provide a quick easy way to support my projects--boxes, picture frames, etc. Excellent. I have it installed on their electric table, which I could not live without. I've been wanting one of these for quite some time. Looks good and I'll review again after putting it through its' paces. Based on the reviews here, I plan on putting a piece of 3/4" ply under it when I mount it on my folding leg set. I do wish it had an additional cross track in the center though. I bought this table top about 3 years ago when I was making cupboards for our kitchen remodel. 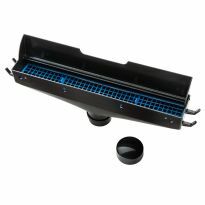 It's ideal for assembling face frames or frame and panel assemblies, using the long stops (Rockler 53845) to keep everything square. 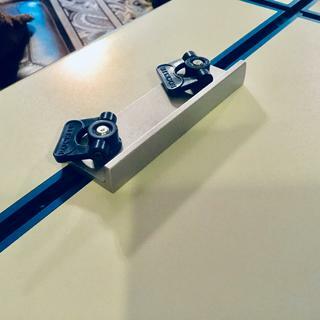 Instead of fixing the top to a stand, I lay my T-Track Tabletop on a smaller table so I can slide it around to get face frame clamps under the tabletop. The tracts pull out over a short time, then the tract stops do not slide on. They get caught on the screws. When I get around to it I will insert longer screws because I made my own base and put a 3/4 ply under the tract table top. So the screws will screw through the table top into the 3/4 underneath thereby having a better hold on the tracts. Very well made. Nice product and a very reasonable price. This table is very well built. Thought about making my own, and there are some vidios on line. 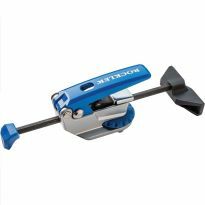 Glad I decided to get this one, it's very nice and heavy duty, put together very good, just like I expect from Rockler. Gave it a 5 star. Would recommend to a friend. 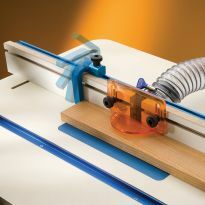 For gluing and clamping, this is best in class. 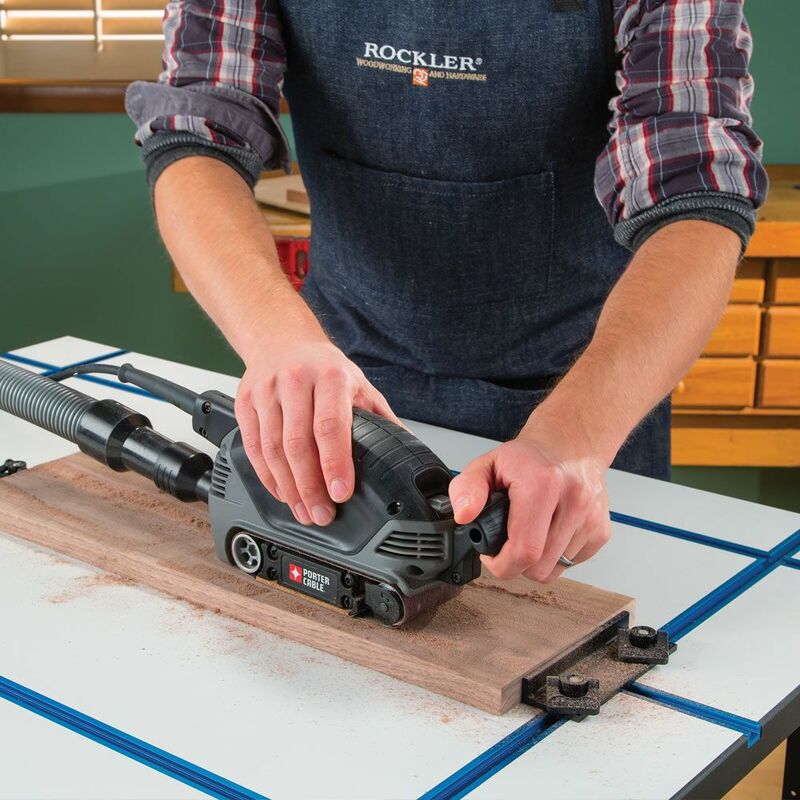 the Rockler top. That allows for extra C clamps around the top. Built a new out feed and assembly cart with three t-track tops. Works great! 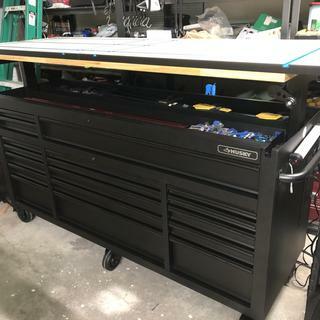 Built a new assembly cart with three t-track table tops and it works great! This was just what I needed for my routing project. Hels down the wood and even the lettering template. How to grow two more hands. Awesome construction and detail. My. new assembly table will be a work of art. Being able to set up dynamic jigs is a real blessing while making furniture. This top along with the right clamps makes just about any job possible. Used this to replace a "Home Made" table. Use it every day. Would recommend it to a friend. 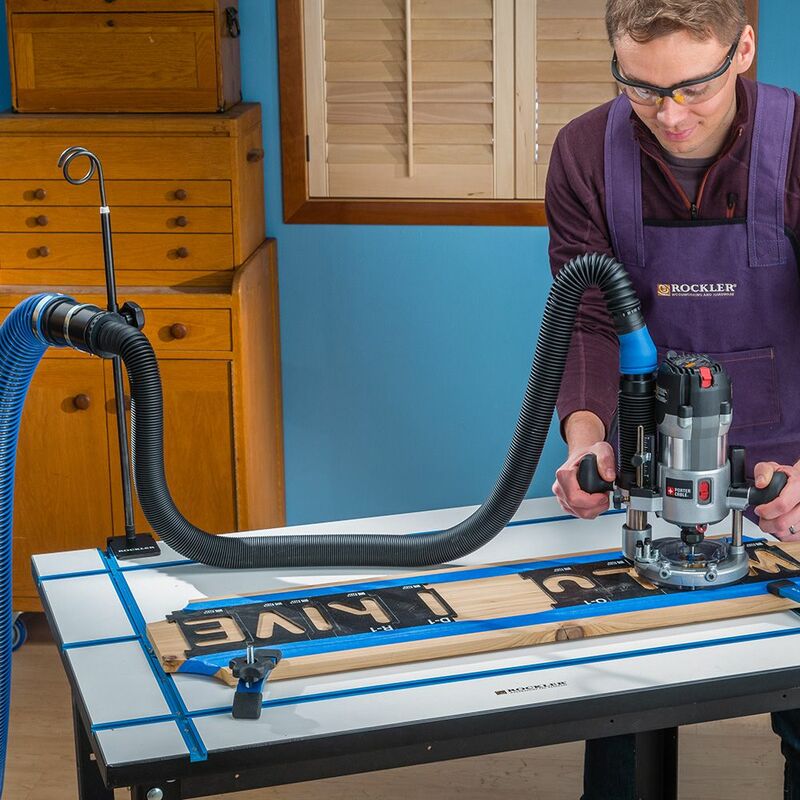 This is a great able top, there is so much you can do on it, it is so handy and they make such neat tools for it I am still learning what all I can do with it. I used the table for glue-ups. It's great because it's really flat, and drops of glue won't stick or can be easily removed with a razor blade or a sharp chisel. I've been wanting one for awhile and when it came on sale I decided to get it. I had one project in mind when I ordered it but now I see it being used for a lot of other things. It is very well made and should give me years of service. I ordered clamps to go with it and they made the job a breeze. I highly recommend it. I usually make these shop helpers myself, however, considering the cost of materials, time and labor, this was an excellent buy. It works. It is a nice feature that the table can be turned over for a flat work space. 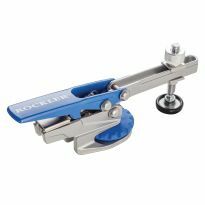 As always I enjoy the many products I have purchased over the last ten years from Rocker's. Your T-Track has given me more success in assembling my projects..
Actually I bought two of these. The first one I cemented six different grades of sandpaper to for my box making projects. The second one will be used with the first one for small veneering work utilizing one of my Festool MFT tables, proprietary clamps with the appropriate cauls. The T- table is very sturdy and we'll built. I built 2 custom cabinet doors the day I received mine in the mail, along with the accessories I purchased,it made the job a lot easier to complete in a short amount of time. Works great...built it into my work table. Products were all they were advertised to be. Got them Quickly. Can It Be Better ???? Yep!! The tracks and surface are nice and easy to use. I simply love working with it. Rockler do ya wanna knock it out of the park? The surfaces on both sides of the table top are great and smooth. Can you make a stand or base for it so it can be easily flipped over and used on both sides. As is the smooth side is wasted and will shortly be ruined. "Or, secured bolts be placed on the sides to easily flip the top making a drafting table?." Looks like a great table but it's very heavy. I do not have it on a dedicated stand because I don't have the room for another free standing table. So, I use it on either my table saw or workbench. Moving it on and off is a problem. But it probably should be this heavy and strong it's just difficult. My other issue is it needs more tracks to be useful for smaller projects. And I need more attachments to make it more useful to me. I use this almost every day. It is my primary workstation when woodworking or ...? It would have been awarded five stars if it had a third vertical t-track and one of the t-tracks came with no screws holding it down. Not a big problem. I had screws to secure it. Rockler needs to kick quality control up a notch at the factory. 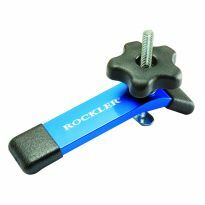 I have been using one of these Rockler Tee Track tables for about two years. As did a few other reviewers I found it useful but the tracks are not secure enough with the wood screws used to hold them down. The solution was to replace the wood screws with machine screws, nuts and washers. I counter bored the holes on the bottom side so the screws were flush with the bottom surface, that still probably limits using the other side as some people wanted to do. Mine is fastened to a work bench so that is not an issue. Purchased to be used for assembly and finish work. TO REPLACE MY OLD ONE. need a good work place. I thought about building one but it would only be about 10 dollars less. 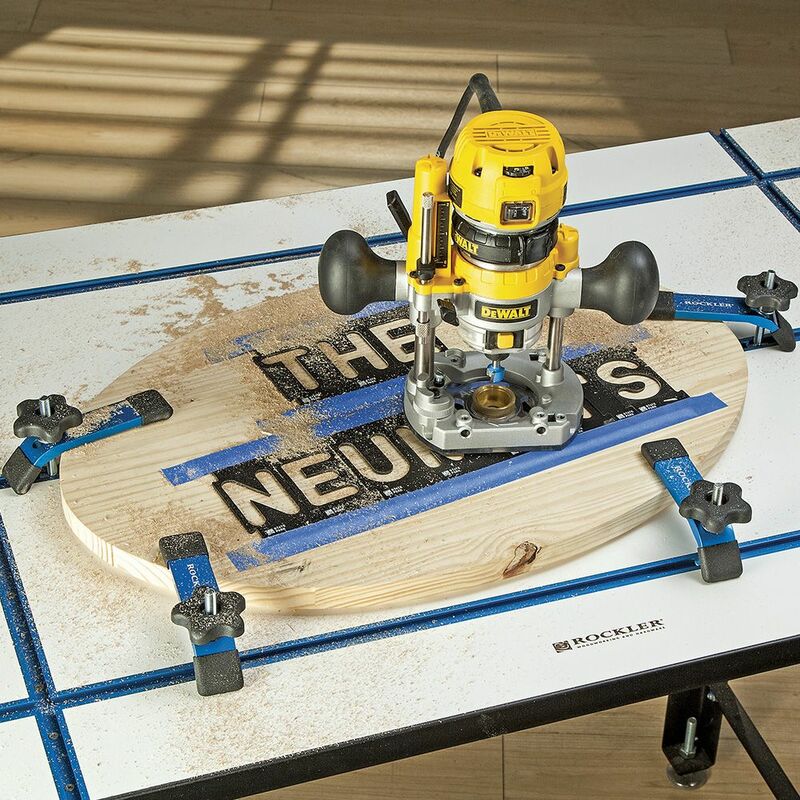 Makes an excellent clamping table for routing or gluing. For the various uses to hold projects on the the bench. 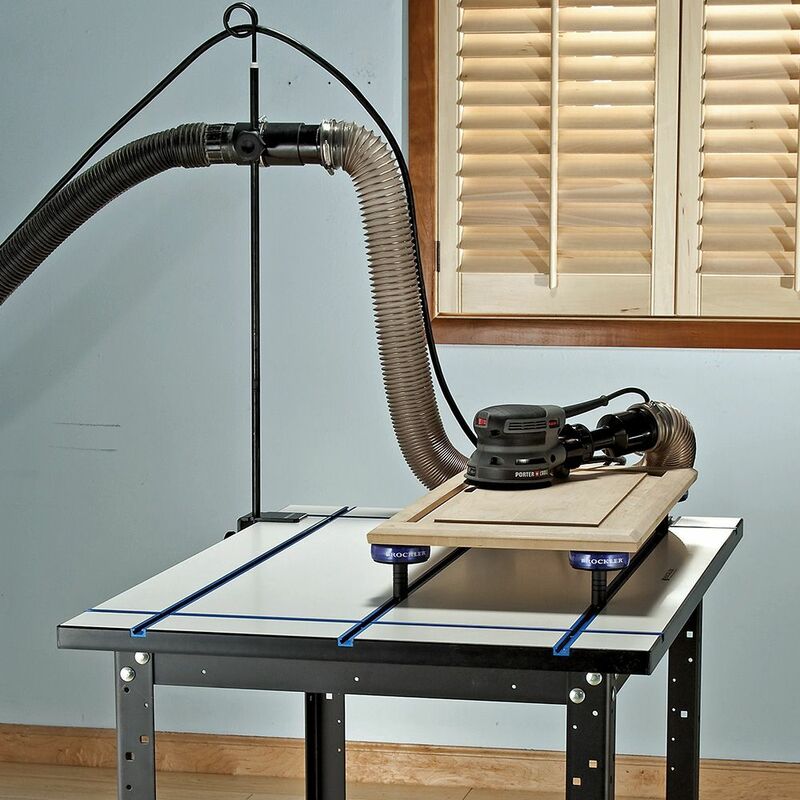 This table would make wood working much faster instead of screwing wood down to the table to hold my projects in place. 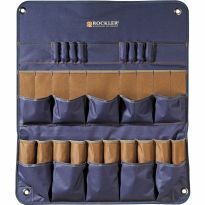 Rockler quality and I know I can expand my skills using this item. 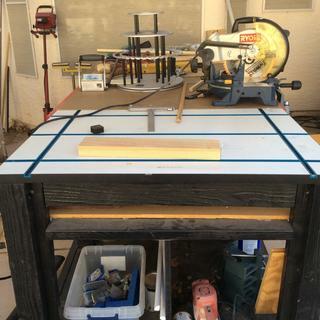 Compared to a workbench, which time prevents from building at this time, this board appears a reasonable interim way to hold stock in place for manual planing. Using it for a cutting/gluing work station. Very versatile, the price was right, and saved me the time of building one myself for all the hassle involved. great top for holding down kreg jigs, etc. added it to the shop stand very portable. It would cost just as much just to buy the t-tracks, especially the intersections and now I don't have to make my own. I currently do not have a woodworking bench. This will help me bridge the gap while I build one. Needed it to put on top of my workbench I am building. To upgrade system for making face frames with pocket holes. This looks like a good system. Saw this and NEED it! It's a little short for 48 inch work, but you can buy two and double the size. 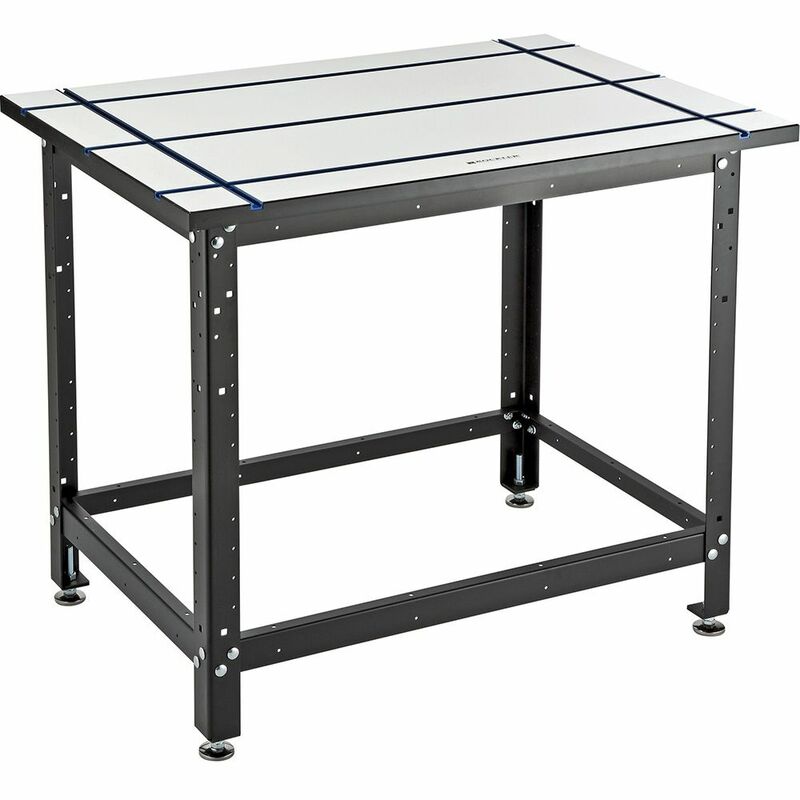 Best option for a workbench top to allow assembly of projects. An extra hand with assembly. I had been looking for something like this for a long time. Ad came up on phone and this item was what I wanted at a sale price. Like the concept. 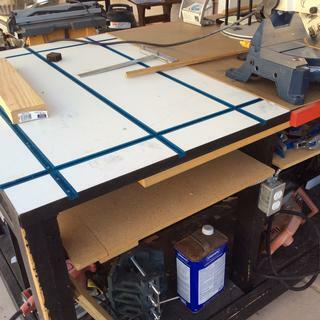 I am building a mobile work station and wanted a nice large router table, this fits the bill perfectly! Always wanted one. It was just priced too high. With a 20% 0ff price plus a $25.00 gift card, it became a fair price. All the accessories will cost a lot, unless they too will go on sale. Steel leg stand, (4) auto lock clamps,stops (6) each etc. To assemble work pieces with the aid of stop kit and Auto-Lock T-Track Clamps. Large framing and gluing project with critical squareness issues. Practically assembly-line work. Was going to make my own table top with t-track and 3/4" MDF however, with the diy solution priced out I was only going to save $25 and then there is the time involved and this top is 3/8" thicker than the top I would have built. Worth my time for $25. I have a very small shop. I'd like to mount this to some lumber so that I can lay it atop my table saw without needing to fully lower the blade. What does the bottom of this table top look like? Is it easy to screw some wood to the bottom of it to hold it on my table saw and above the blade? BEST ANSWER: I don't recall what the bottom looks like. You can screw wood to the bottom of it but you might want to use some kind of a threaded insert as the material is more like an MDF. Yea, screwing in from the bottom, without going through probably has limited value. That's why I was hoping there was already some kind of pre-mounted bracket that would be used to mount it to the Rockler table. 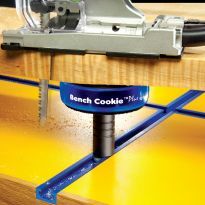 What are some good methods of attaching Rockler T-Track Table Top to Material Mate? I have read a number of places online that the T-Tracks on this table arent difficult to lift up when strong clamping pressure is used. I was intending to mount this table to a sheet of 3/4" Baltic Birch and then to the Rockler metal stand for added support against the sagging I had also read can occur. Would it be better to remove the stock screws holding the T-Track down and replace them with longer ones that go through the table top and into the Baltic Birch underneath? Or perhaps use bolts all the way through and washers and nuts on the other side? BEST ANSWER: My understanding with "T" Tracks is that they are designed mostly for light clamping and any significant upward stress is going to be met with problems primarily because of the small fasteners, but also the relatively soft materials the tracks and table are constructed of. 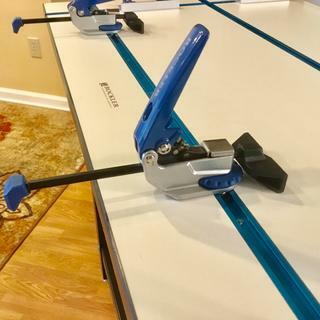 I bought mine to work with my Festool MFT tables (that fit beautifully by the way) and contact cemented several different grades of sandpaper to. The reverse side has a nice clean hard flat surface ideal for small detail work. I have a number of thick work surfaces that I have drilled 3/4" holes through for rugged clamping setups, you just might find this system much more to your needs than "T" Tracks for now. Haven't had a problem with screw tear out or sagging as of yet, I bought my table in the store and noticed that one of the screws on their display model was missing so your two ideas would truly eliminate any possible problem in the future. It is a great table and have truly enjoyed it thus far. Bolts through with washers and nuts would be the way to go. My garage is so small that I would need to use the tabletop on folding sawhorses instead of the base, then store the table top vertically when the cars are in the garage. Would the top stay on saw horses just based on it's weight alone? BEST ANSWER: I have mine resting on a very heavy table. It is, however, held also by its edges so it can't move. The bottom is a somewhat slippery material so ot would probably slide if leaned into if it were simply resting on top of the saw horses. It would work if you hare careful but it would be better if it were supported also in some way that it couldn't easily be pushed off the saw horses. The t track table itself is very heavy and would not come off the saw horses unless pushed - say by leaning into it with your body. Nope. They definitely need to mounted, as the laminate is very slippery and any type of force while working will cause them to slide. I have not done this but the table is quite heavy.. If you use it just to clamp things, it should be OK. 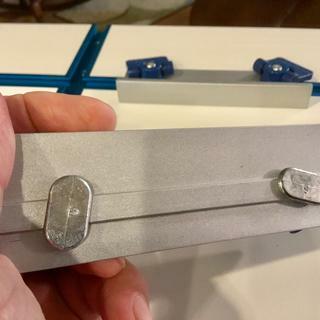 I would suggest that you build a folding work table with some quick connect fasteners. I bought this table top and the shop stand to go with it, but see no obvious way to mount one to the other. Do you actually have to screw through the veneer, or is there a more clever way? BEST ANSWER: The top is attached with screws driven through the leg assembly and into the top. Screws are provided. Predrilling is a good idea. I'd suggest attaching from the bottom. Mine is clamped to a workbench when used. Did you call Rockler? I didn't use my table tops in this fashion, (clamping veneer) but if I were to use the stand I would most likely use some 1/4" 20 (or similar) mounting screws and countersink them below the surface assuming such holes are provided on the table. I used this method mounting the drill press table top utilizing 5/16" screws counter bored with 1" flat washers and it's very secure. While a good product, the substrate is a soft MDF type material certainly not lending itself as a good strong medium for using wood screws, or worse yet, lag bolts. 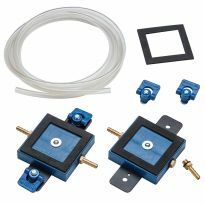 Will Kreg Clamps and accessories fit these tracks? What is the distance between the table edge and the t-track? BEST ANSWER: 4 inches from the first track and 14 inches from the second track (10 inches between the first and second track. The outer edge to track is also 4 inches. I find the hold downs do not work well if you are trying to hold down a smaller piece since the tracks are not as adaptable as when using peg holes in a table top. I do like the top. It's quite sturdy. Can be flipped over if you want a solid table top. The distance between the outside edge of the table top to the outside edge of the track is 3 5/8 inches and 4 inches to the center of the track from the outside edge of the table. The center of the T track nearest to an edge is 4 inches from the edge of the table it is parallel to on all sides. The T track is 3/4 inches wide. 4 inches from edge of table to center of T-track. T-track is 3/4" wide. About four inches in both directions. Can you group more than one top together, eg. Make an 80" or 120" long combined table? BEST ANSWER: I suppose so, although I hadn't thought to try it. The edges are relatively flat and the channels are open at the ends as they must be to get the hold downs in. So, if two or more were aligned properly, one could probably move the hold downs across a small gap into an adjoining table. Of course, you would need an underlying flat table large enough to accommodate two or more linked together. A good question, I had ulterior reasons for purchasing this item. I have two free standing Festool MFT tables used in conjunction with the track saw that I find indispensable for cutting large pieces of plywood all which can be taken down and stowed when not in use. Since this table has a nice flat plastic laminate surface I thought it ideal for sanding precision surfaces by gluing 9" X 11" pieces of different grade sandpaper to it with contact cement. It fits beautifully over a MFT table with no overhang. I recently had surgery on my hand, so much of my small box building projects will be in the near future for now. In regards to your question; I see no reason to go ahead with what you intend. The table has a smooth undisturbed laminate under surface, (big plus for me) so whatever you plan to mount it on you'll have to fabricate. The quality is very good, but don't plan on doing any drilling or cutting on it or you'll compromise the surface. I have two of them side by side. As long as you align the tracks properly and screw them both down to a solid surface should work fine for you. I am able to slide the accessories from one table to the other with no noticeable binding. The T-track tables are heavy, you need to make a strong support under the track tables. If you can line up the tracks, then grouping the tables together should work. It would be possible to join several tables together using the long stops to hold them together or some other device of your own design. 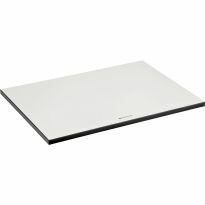 Will this fit on the top of the material mate and still give you room for full sheets of plywood? What is the recommendation for fastening this top to a stand? I installed an entry door striker plate (curved side facing inward) on each side of the stand rails. 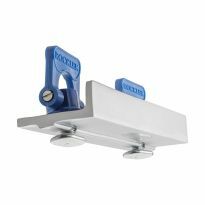 This enables table top to be secure yet easily removable by lifting top up. I installed striker plate to small piece of wood sized to table top and secured that to upper stand rails. Make sure striker is slightly lower than table top edge. I don't have mine mounted. I use mine as a portable table in a small portable clamping work bench. I screwed a cleat to the bottom and clamp it in the clamping bench. It works great for me. Is the t track screwed in from the top or bolted from bottom? BEST ANSWER: from the top allows a smooth track face for clamps to slide on. From the top - screws in the bottom o each channel. 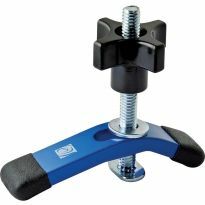 How does the T-Track Clamping Table attach to the Rockler metal stand? Are there inset threads in the table for bolts? Or is it just done with wood screws from the bottom though the mount holes in the table? BEST ANSWER: I screwed my tabletop to my shop built stand with wood screws into the MDF. 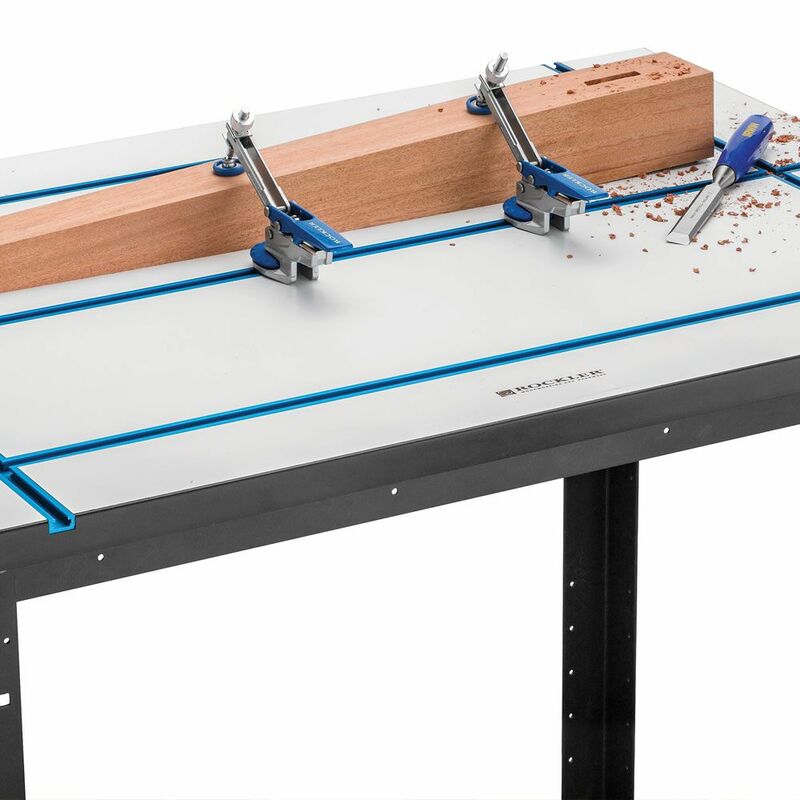 I'm pretty sure that the tabletop would be attached to Rockler's metal stand the same way. I mounted mine to a converted old kitchen cabinet. Didn't use the stand. Works great and underneath is a router table. I used 90 degree brackets from lowes lumber connections. Not the Stanley 90's because they are wider and more secure. With my drill and releasing 4 screws I have my router table. Though now have a second router table that I built onto my new delta table saw also from lowes. I have since engineered a telescoping out feed table. All my materials bought from lowes. Lowes has the most intuitive employees u have ever come to know. They help you engineer things that aren't always on the market. I mounted the T-track table top to the Rockler metal stand by screwing directly into the MDF. I used screws designed for MDF that I bought at Home Depot. I also designed and made a two drawer case to mount to the metal frame that holds the T-track accessories and other items I use with the table. Round head screws through the frame and into the bottom of the table top. What is difference between in line stop and the short stop? They appear to be the same to me. 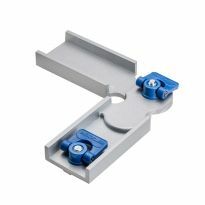 BEST ANSWER: The Inline Stop measures 1-1/2'' x 1-1/2'', and has a T-slot keyway running perpendicular to the stop face. I like using it for framing pieces joined at 90 degrees. The short stops have the same clpomg mechanisms but are more like workbench stops. Hope this helps. The difference is the angle relation of the T Rack to the angle of the stop. The Inline stop is at 90 degrees to the T Track and the short stop is parallel to the T Track. BEST ANSWER: Mine is attached to a wooden base from below using wood screws. I made sure I was screwing into the meaty part and not the track section and made sure my screws were not too long. If securing to a table top frame or something else you can install bolts on the underside. Folks at Rockler have the hardware for it. Hi, on the table what is the distance between the tracks from the edge. Vertical and horizontal? BEST ANSWER: The black edge around the top adds to the measurements. 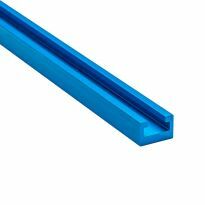 Each measurement are from edge to inside the track parallel with the edge. All outside tracks are 3-7/8 inches and the center track is 13-7/8 inches. Over all measurements are 40-1/8" long and 28-1/8" long. With the tape measure hooked to the outer edge of the track, 3 7/8" both vertical and horizontal. 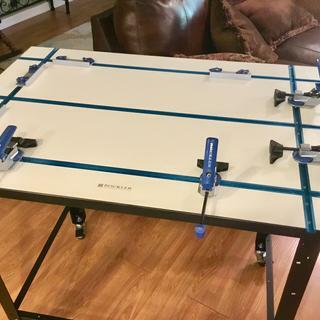 Will this table and T-track work with the Kreg Heavy-Duty Clamp System? I own two clamps and deluxe cookie set. BEST ANSWER: I do not have any kreg camping equipment. 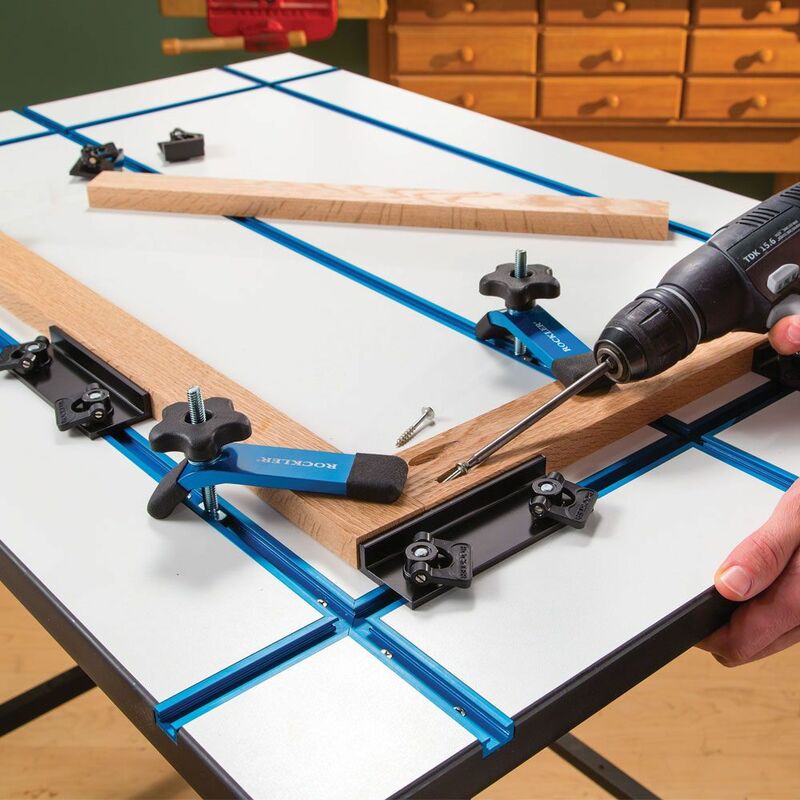 A thought only... if your kreg clamps will fit the standard Rockler t-track it should fit the table top. Sorry I couldn't be of more help. Yes it will, as long as the guide t-screw for the tracks fits in the track. 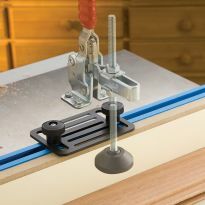 If it doesn’t you can always replace the guide t-screw for the kreg clamps to make them work. What is the best way to attach t track table top to legs? BEST ANSWER: The table top should have included a bag of screws. Turn the table top upside down on the floor or a work bench, center the leg assembly on the top and screw in the screws. It would be helpful to pre-drill the screw holes. I built a cabinet frame from 2x4s and screwed up through its top into the T-track table. 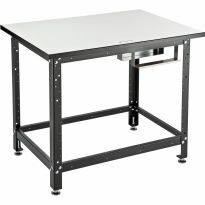 Do kreg clamps work on this table ? BEST ANSWER: Identify which Kreg clamp is in question?